On December 4, 2018 (Tuesday), Iran’s President Hassan Rouhani issued a threat to close down the Strait of Hormuz, the passageway for nearly a third of all oil traded by sea, if the U.S. tries to shut off Iran's crude exports. 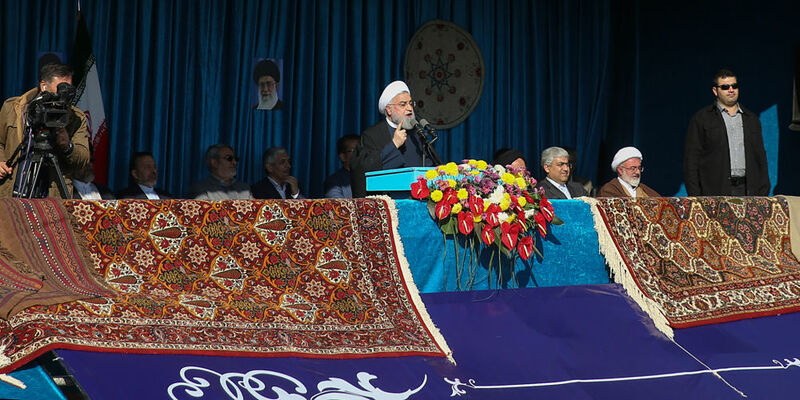 At a televised rally in the city of Shahrood (Semnan province), Rouhani said, "America should know... it is not capable of preventing the export of Iran’s oil." He further added, "If it ever tries to do so... no oil will be exported from the Persian Gulf". His comments are reported by the Islamic Republic of Iran Broadcasting (IRIB) news agency. Rouhani's comment came days before the scheduled arrival of a U.S. Navy's aircraft carrier strike group in the Gulf led by USS John C. Stennis (CVN-74). Such carrier-level deployment has been absent from the region (for the longest period in two decades). Earlier in July, Rouhani made similar kind of comments. In the same month, an Iranian Revolutionary Guards commander, Ismail Kowsari, issued a similar kind of "threat". Iranian Vice President Eshaq Jahangiri also said on Tuesday that U.S. sanctions were hitting vulnerable people in Iran. "When (Americans) say their target is the Iranian government and there won't be pressure on the sick, the elderly and the weak in society, it's a lie," Jahangiri said, according to the state-run Islamic Republic News Agency (IRNA). After U.S' withdrawal from 2015 Joint Comprehensive Plan of Action (JCPoA) between Tehran and major world powers in May 2018, Washington has re-imposed its unilateral anti-Iran sanctions which include sanctions on Iranian oil exports, the country's central bank, and Iranian businesses. Initially, U.S. vowed to reduce Iran’s oil exports to "zero" through the "re-imposed sanctions", but it later backed down and granted waivers to almost all of Tehran’s major crude buyers such as China and India. Since the 1980s, Iran had been repeatedly issuing threats such as creating a blockade in the Persian Gulf in response to any international pressure on its current regime which has come into existence after the 1979 Islamic Revolution. The recent "tough talk" by Rouhani, who is in general considered to be a moderate, has been warmly welcomed by his hardline rivals within the country.